Last week when I was watching Giada De Laurentiis cook some amazing Hawaiian themed foods on her show, I got all excited when she made the fish tacos using won ton wrappers as the shell. Genius! 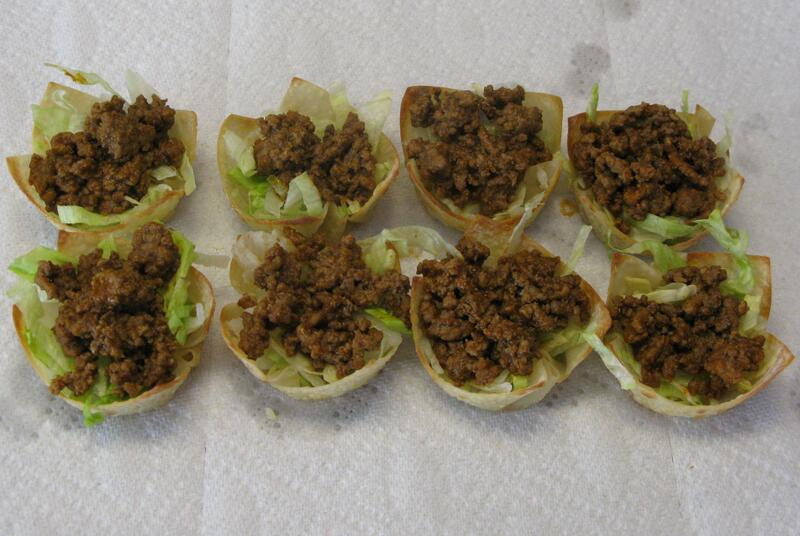 I exclaimed, “I can make regular mini tacos with those shells and use beef! YES!” and clapped my hands together excitedly. My husband was sitting next to me on the couch, reading a book. He responds by saying, “Shhh.” He’s no fun. Maybe he won’t get as excited as I did, but he’ll certainly love them! 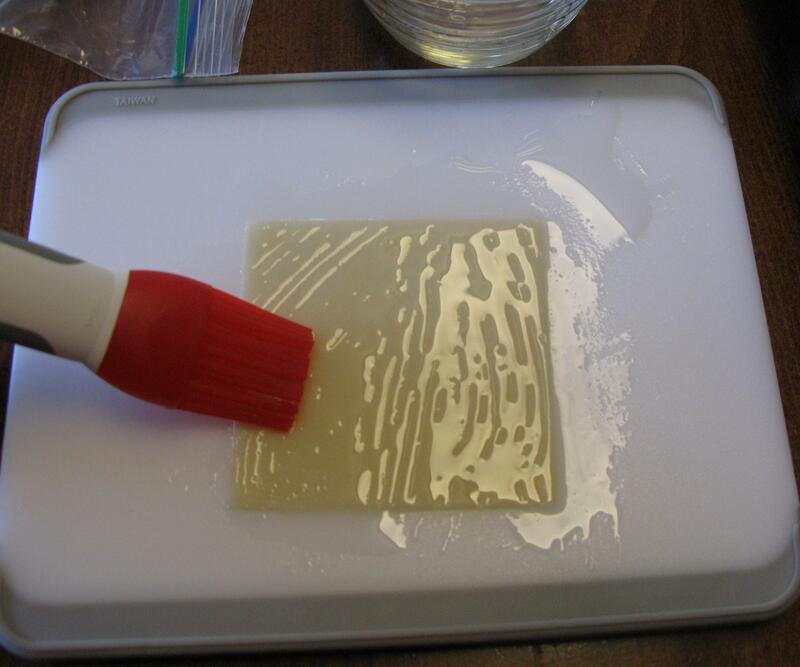 Start out by brushing won ton wrappers with vegetable oil. 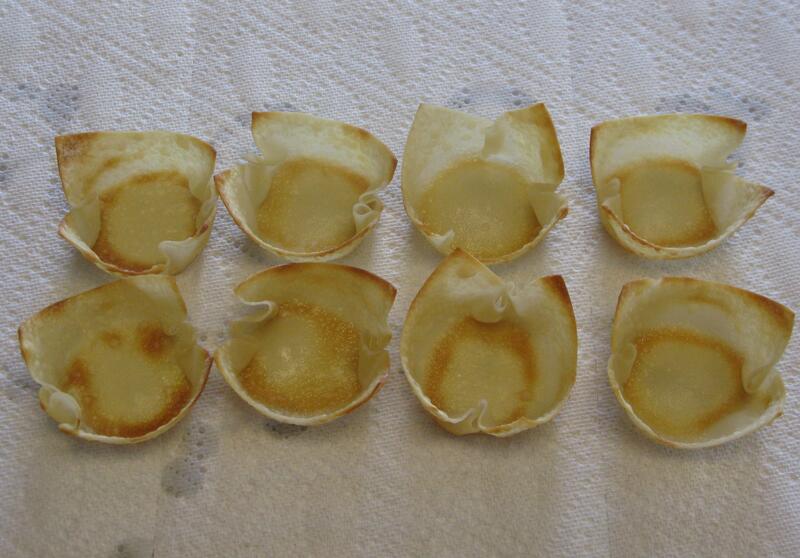 Gently press them into a muffin/cupcake pan, and bake at 375 degrees for 5 minutes. Let cool completely. 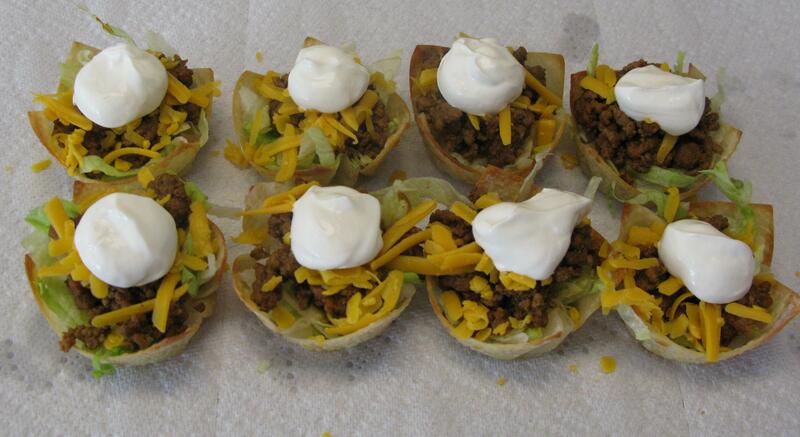 These have got to be the cutest little taco shells I’ve ever seen. The great thing is that you can make these the day before your party so they’re ready to be stuffed the day of the party. Stuff ’em good. 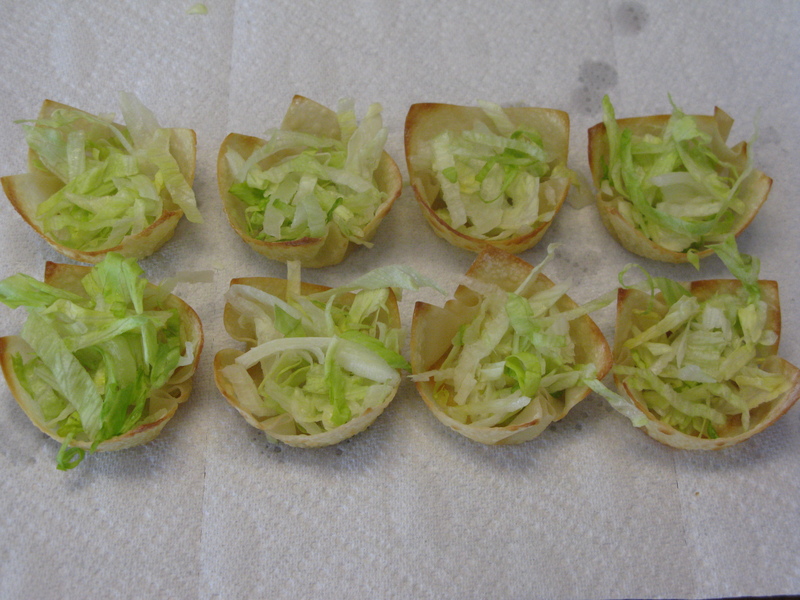 Sprinkle some shredded lettuce on the bottom of the shells. Cook the ground hamburger with taco seasoning and 1/4 cup water, then spoon on top of lettuce layer when finished cooking. Cheese, please! Why, of course. Top with spoonful of sour cream. Taa Daa! The great thing about these is that you have complete control over portion size. You can make as many shells as you want. You can stuff as much of each item in the shell that you want. You can eat as many as you want, hoarding all of them and fight off your party guests with a plastic pirate sword and yelling, “Arrrr! 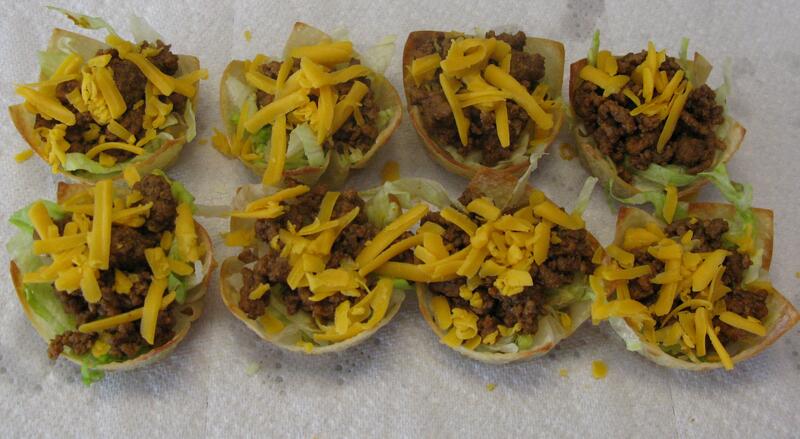 MY mini tacos!” just to make the party interesting. Just a thought. Cook hamburger in skillet until browned completely cooked through, add water and taco seasoning. 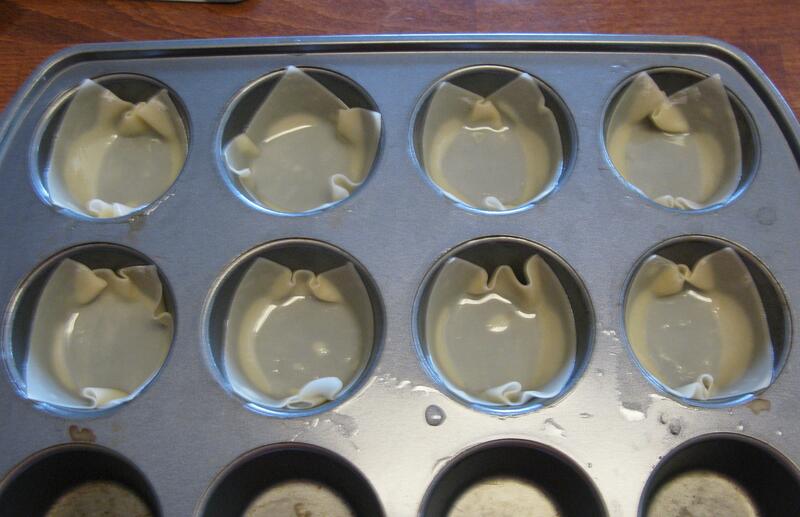 Brush won ton wrappers with vegetable oil, then gently place in muffin/cupcake pan and bake at 375 degrees for 5 minutes. Let cool completely. 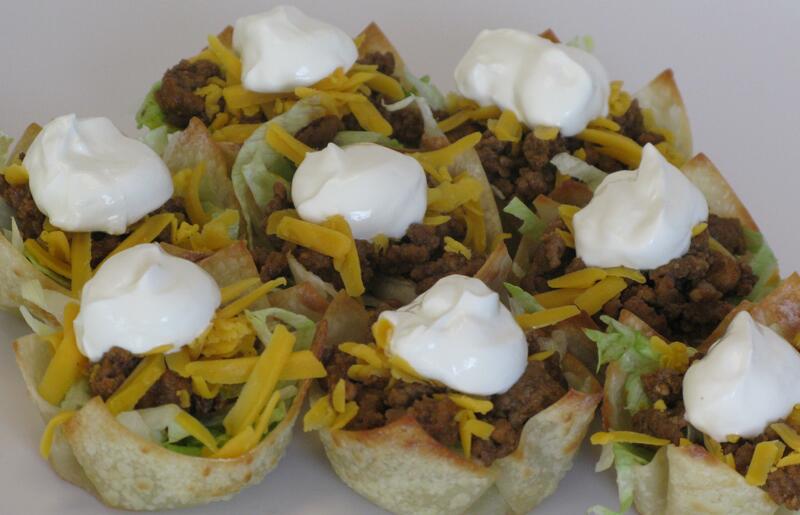 Sprinkle with shredded lettuce, top with ground beef, then cheddar and top with sour cream. Other available options are tomatoes, black beans, corn, mushrooms, etc. So cute! They look delish too!